Popular Alaska Governor Sarah Palin stumped in Maine today. She joined country singer Lee Greenwood and Maine Senator Olympia Snowe for a rally with thousands of supporters at the Bangor airport. The people of northern Maine enjoy moose-hunting, fishing and snowmobiling. So, Sarah Palin should have felt right at home. Governor Palin gave “Joe the Plumber” a big shout-out while she was there. Sarah Palin evoked the highlights of her running mate’s debate messages Thursday as she worked to pick up at least one of Maine’s four electoral votes. …Palin also evoked “Joe the Plumber,” and his female counterpart, Jane. Joined by singer Lee Greenwood and Sen. Olympia Snowe, Palin acknowledged the state’s tradition of electing females to federal office. Maine has voted for the democratic candidate in every US election since 1992 but this year the McCain-Palin ticket see a chance to take back at least one electoral vote from the state. The Maine Republican Party announced Tuesday that they were forced to move the Palin rally to a larger venue due to the high demand for tickets to see the popular governor. 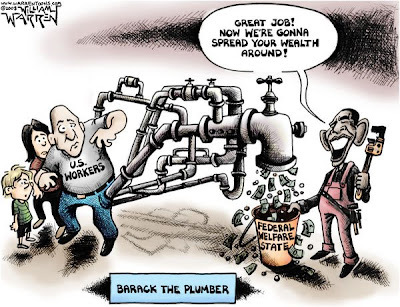 UPDATE: The followers of Dear Leader are are not going to let an Ohio plumber stand in their way to socialist utopia. They are currently on a mission to destroy him. The Obamabots were giddy to discover that Joe doesn’t have a license – which, according to Jim Geraghty, if the smear artists bothered to check the law, he only needs for commercial work, not residential work. UPDATE 2: I am Joe the Plumber.